[ comfort zone ] represents a complete system of care for the skin, body and soul. Their exclusive collection of treatments has been created with an unwavering commitment to finding the most powerful ingredients and delivering the most effective results. They believe in working from the inside out, and from the outside in to improve the human condition and treat the whole body. They seek to promote a holistic, healthy and sustainable lifestyle, based in science and strengthened by passion. Choose from a list of skin & body treatments from our highly dedicated [ comfort zone ] trained therapists. State-of-the-art ultimate anti-ageing facial combining new Archi-Lift technology with the renewing effects of the double peel for an instant re-plumping effect. Ideal for mature skin with visible signs of ageing, this firming facial stimulates cellular regeneration using the exclusive active lift massage technique to smooth and tone skin. The result is smoother, radiant, more youthful skin. 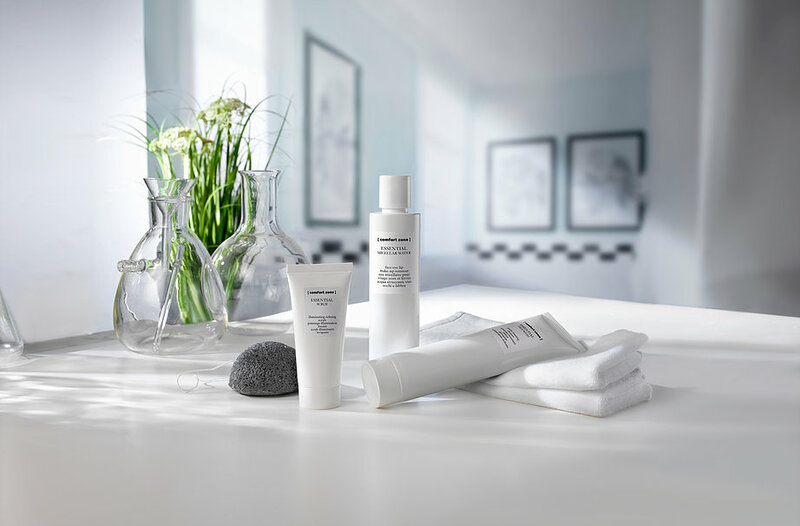 Designed to alleviate the undesirable effects of Hormon-Aging™ on both skin and emotions, the treatment counters skin thinning, extreme dryness, loss of skin density and any feelings of fragility. Thanks to two special massage techniques, Dermal Petrissage and Kobido, the facial reactivates cellular communication, offering deep regeneration of the skin and a new-found serenity and vitality. Hormones play a significant role over the course of every woman’s life. Their cyclical fluctuations can influence the physical, mental and emotional well-being. Hormones are like messengers that send signals to adjacent and distant cells, ensuring their proper functioning. With the advent of menopause, the estrogen and progesterone drop triggers significant changes at various levels of the body. Beside general alterations such as different fat distribution and hot flashes, they also influence the emotional sphere with mood swings and depression. At skin level, the main distinctive consequences of the hormonal deficiency are extreme dryness, loss of density and thinning skin, together with an acceleration of the typical signs of aging, such as wrinkles and sagging. Hormon-AgingTM is the aggravated aging process that results from an “anarchy” in the skin, generated by the drop in hormones and the consequent impaired communication network among cells. As a result, the activity of the collagen production centers, the fibroblasts, and the functioning of the skin barrier are weakened. A powerful lifting facial targeting sagging cheeks, jowls, chin and neck for a visible rejuvenating effect. The advanced mask helps to oxygenate skin cells and gives an instant firming effect. The result is a beautifully nourished, illuminated, firmer and lifted skin. A complete body massage using powerful essential oils and deep tissue massage movements to provide a powerful experience. Aching muscles are relieved and tension is reduced, restoring energy to mind, body and soul. A replenishing treatment for restoring perfect tone, elasticity and restoring moisture balance. Leaving the skin soft, silky and compact. A sensorial cocooning experience and the perfect body treatment for soft toned skin. Ideal for dry skin and as an after-sun treatment. A muscle warming, remineralizing and purifying body wrap, made with thermal waters from Grotta Giusti mineral springs in northern Italy. A healing and restorative treatment leaving the body revitalised and free from muscle fatigue, stress, and pains associated with joint problems. This wonderful treatment is finished with our Copper Bathing Experience. An intensive treatment with thermal water from Bagni Di Pisa with detoxifying and anti-cellulite actions. A blend of essential oils encourages a profound purification of the tissues while the fucus and laminar algae promote a lypolytic action. This detox treatment is finished with our Copper Bathing Experience. An intensive treatment with thermogenic action specifically for profound and resistant cellulite imperfections. Improves microcirculation and promotes remodelling of the body. A nourishing, firming and elasticising treatment to ensure the skin remains supple during this time of transformation. A complete face and body massage that ensures an overall sense of wellbeing and relaxation. A unique sensorial and aromatic wellbeing ritual for the face and body aimed at favouring complete relaxation of mind and body. Experience a profound sense of wellbeing resulting in relaxed muscles, improved circulation and visibly oxygenated, luminous and nourished skin. A wonderful treatment partially great for ultra stressed and for those who can’t sleep. This renewing volcanic scrub ritual uses minute lava particles combined with nourishing karate butter and enhanced with your chosen essential oil, blended to smooth and soften the skin leaving it radiant. An ideal complement to the Aromasoul elements. An extraordinary ancient ritual for the body which begins with body massage using warm, Himalayan salt stones, which immediately bestow relaxation, alleviating tension, stress and anxiety. The treatment proceeds with an exhilarating salt scrub; a combination of the precious pink Himalayan salt with a nourishing aromatic oil to completely detoxify the body, ease aches and pains, stimulate the metabolism and restore vitality and balance. Modern plant chemistry for the urban dwellers. 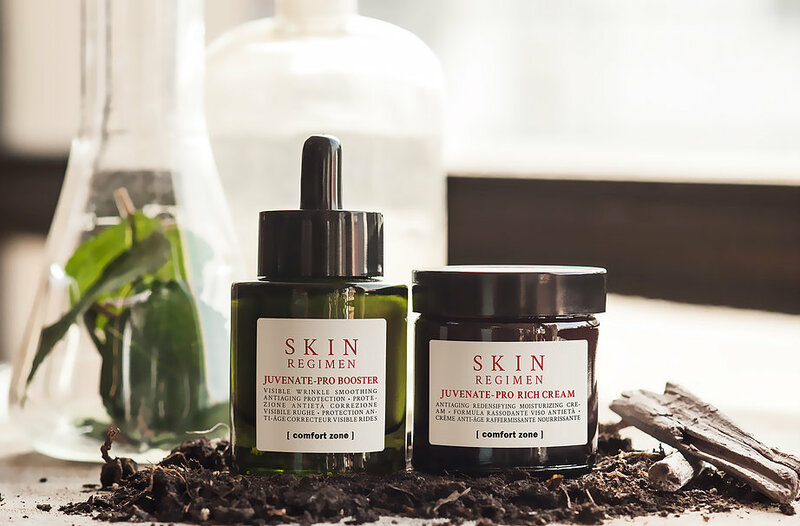 Skin Regimen is the new skincare line for fast-paced people with stressed skin. A natural cosmetic system with organic active ingredients that follows the rigorous formulate parameters of ecocert. The philosophy of [ comfort zone ] has its roots in the knowledge that the synergy of the wisdom of nature and the intelligence of science is the ideal combination and solution to offer formulations which are avant-garde, in terms of safety, efficacy and sensorial pleasure. With sacred nature [ comfort zone ] offer a range of products which follow the original formulation philosophy of the brand in the choice of raw materials as well as for their efficacy and sensorial benefits but at the same time strictly adhering to the ecocert guidelines. A line of face and body products with natural and organic ingredients, extremely effective in nourishing and protecting the skin and able to offer advanced results as well as immense pleasure to the senses, meeting the needs of the green consumers, as well as those whose needs are more nourishments, sensitivity and DNA anti-ageing.